There are so many ways to fundraise – take a look at our A-Z of fundraising ideas on the left for inspiration to get started. Once you’ve decided on your challenge here’s a list of handy hints and tips to help with your fundraising. It’s easy to support us by organising your own activity or get together with friends. Taking on a personal challenge is another brilliant way to support Dorset Mind – plus we think it feels great too! It’s easy to do, and even easier to share with friends. Find us on Virgin Money Giving here. All you have to do is click the ‘Start Fundraising’ button on the right of the page. And don’t forget to let us know what you’re doing – we can help you promote your event on our Facebook and Twitter accounts. If you would prefer to print some forms, please see the link on the left for a Sponsorship Form. 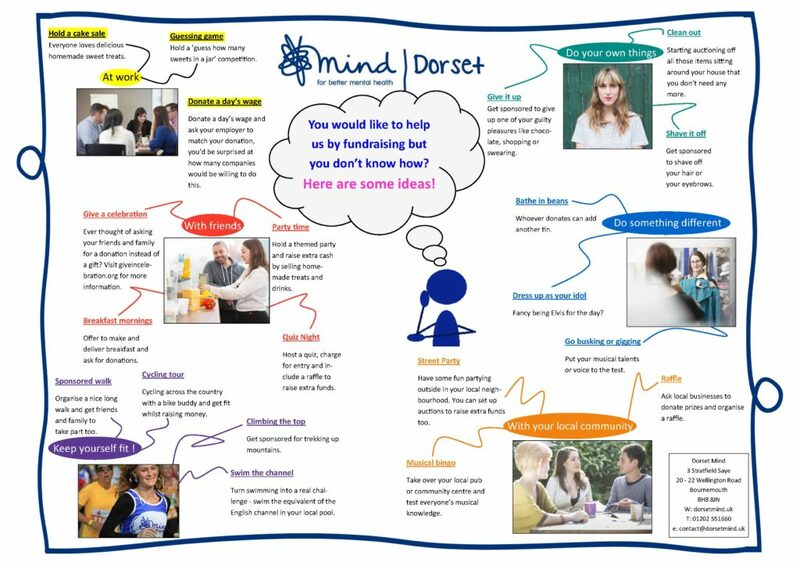 If you have any questions about fundraising for Dorset Mind, click here – so we can help you to support us!